12 total results were found for this item. Ordered by high price to low price. 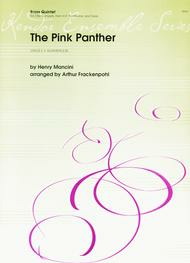 The Pink Panther composed by Henry Mancini. Arranged by Michael Brown. For Concert Band (Score & Parts). 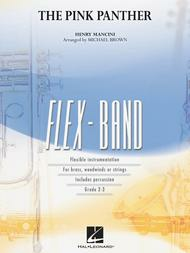 FlexBand. Grade 2-3. Published by Hal Leonard (HL.8725297).One of the most recognizable movie themes of all time! With its slinky swing style and familiar melody, this arrangement for flexible instrumentation is sure to become one of your most requested tunes. The Pink Panther composed by Henry Mancini. Arranged by Robert Longfield. For String Orchestra (Score & Parts). 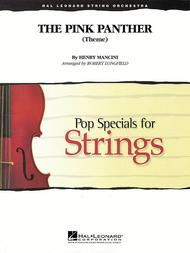 Pop Specials for Strings. Grade 3-4. Published by Hal Leonard (HL.4626470).Henry Mancini's most recognized theme is a jazz classic that your students will love to play with this new arrangement from Robert Longfield. Great riffs, cool harmonies, and a spot for a jazz violin solo (written version included) make it a super program choice for your students. 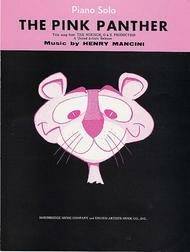 The Pink Panther composed by Henry Mancini. Arranged by Paul Murtha. For Jazz Ensemble (Score & Parts). 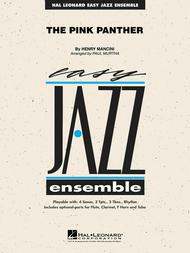 Easy Jazz Ensemble Series. Grade 2. Score and parts. Published by Hal Leonard (HL.7011802).Instantly recognizable by all, here is one of the all-time great movie themes in a masterful arrangement for young players. Paul does a great job of capturing the authentic sound of Mancini's classic from the familiar bass line, smooth tutti ensemble passages, and solo section for tenor sax or trumpet. It doesn't get any better than this! 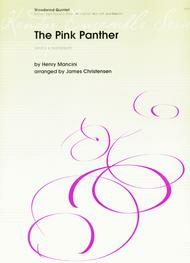 The Pink Panther composed by Henry Mancini. Arranged by Calvin Custer. For Clarinet Choir. Woodwind - Clarinet Choir. Ensembles That Swing. Movie. 48 pages. Published by Alfred Music (AP.29019).Ensemble for clarinet choir with rhythm section accompaniment. Download free full-performance and accompaniment recordings from the publisher's website (registration required). Play along with the music and learn the correct style with the full-performance track. The accompaniment track includes only piano, guitar, bass, and drums, so, if you don't have a rhythm section, you can play along with this track in rehearsal and performance. The Pink Panther composed by Henry Mancini. Arranged by Robert Longfield. For String Quartet (Score & Parts). Pops For String Quartet. Grade 3-4. Published by Hal Leonard (HL.4491241).Henry Mancini's most recognized theme is a jazz classic that string players will love with this new arrangement from Robert Longfield. Great riffs, cool harmonies, and a spot for a jazz violin solo (written version included) make it a super chart for string quartet. 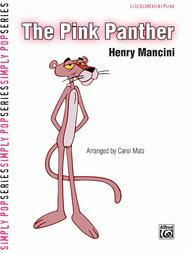 The Pink Panther composed by Henry Mancini. Arranged by Arthur Frackenpohl. For brass quintet (2 trumpets, french horn, trombone and tuba). Movies, Jazz, Pop. Grade 4. Score and set of parts. Published by Kendor Music Inc (KN.18960).Marked "groovy misterioso," this swingin' version of the famous Mancini theme opens with trumpet and horn players snapping their fingers while low brasses play the iconic intro. Later on 2nd Trumpet takes an improvised-or-as-written solo before the final tutti statement and subdued finish. Both trumpet parts require cup mutes. Duration 2:35. 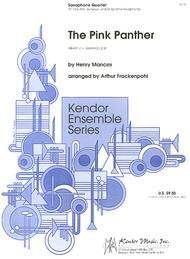 The Pink Panther arranged by Arthur Frackenpohl. For saxophone quartet (2 alto saxophones, tenor saxophone, and baritone saxophone) (2 altos, tenor and baritone saxophones). TV and Movies. Grade 4. Score and set of performance parts. 8 pages. Published by Kendor Music Inc (KN.16170).Marked "groovy misterioso," this swingin' version of the famous Mancini theme opens with both altos snapping their fingers while tenor and bari play the iconic intro. Later on lead alto takes an improvised-or-as-written solo before the final tutti statement and subdued finish. Duration 2:35. The Pink Panther composed by Henry Mancini. Arranged by James Christensen. For woodwind quintet (flute (opt. 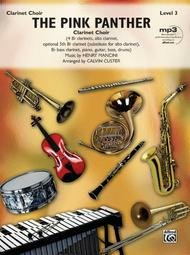 piccolo), oboe, Bb clarinet, horn in F, basson) (flute, oboe, Bb clarinet, french horn and bassoon). TV and Movies. Grade 3. Set of performance parts. Published by Kendor Music Inc (KN.16940).Scored in swingin' 12/8 time, this version of the ever-popular Mancini movie theme features some great special effects -- finger snapping, playing a hi-hat cymbal pattern through a mouthpiece only, jazzy long falls played by all, and more! Duration 2:30. The Pink Panther composed by Henry Mancini. Arranged by Carol Matz. For piano. Piano Solo - Popular Sheet; Solo. Simply Pop Series. Late-Elementary level. TV and Movies. Late Elementary. Single. 4 pages. Published by Alfred Music (AP.25703).Because of the remake of this classic movie, the demand for Henry Mancini's most famous melody is high! Alfred's "Simply Pop" series offers two highly accessible and fun to play arrangements of the theme from The Pink Panther. Each sheet solo has been carefully edited and graded so that students, hobbyists and Pink Panther fans can indulge in this classic theme! The Pink Panther composed by Henry Mancini. Arranged by Calvin Custer. Orchestra. Full Orchestra. Concert Full Orchestra. Movie. Grade 3.5. Conductor Score & Parts. 154 pages. Published by Belwin Music (AP.2739PB6X).Henry Mancini's music has thrilled audiences for years and Calvin Custer's arrangement for orchestra brings back those pleasant memories that make this the most recognized movie theme of all time. A superior work! The Pink Panther (Piano/Vocal/Chords). Composed by Henry Mancini. For solo piano. This edition: Piano/Vocal/Chords. Piano/Vocal/Chords; Sheet; Solo. Movies and TV. SMP Level 4 (Intermediate). Single. Chord names (does not include words to the songs). 4 pages. Published by Alfred Music (AP.2739PSMX).ISBN 0739071726. With chord names (does not include words to the songs). Movies and TV. 9x12 inches.About SMP Level 4 (Intermediate)Introduction of 4-note chords and sixteenth notes. Hand movement covering 2 to 3 octaves. The Pink Panther composed by Henry Mancini. Arranged by Jay Althouse. Choir Secular. SATB choir. Choral Octavo. Pop Choral. Jazz; Secular. Choral Octavo. 12 pages. 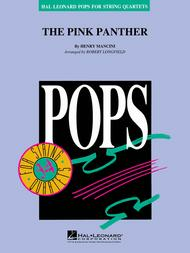 Published by Alfred Music (AP.28473).Your men will be cooler than cool, scatting this catchy movie theme! The opening riff is "ba dop ba da," with finger snaps. Then the voices imitate the horns. A favorite in all voicings!Inst. 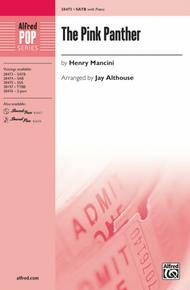 Parts Available (choral); Recorded Acc. Available.About Alfred Pop Choral SeriesThe Alfred Pop Series features outstanding arrangements of songs from the popular music genre. 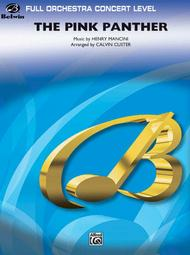 These publications provide exciting, contemporary, and educationally-sound arrangements for singers of all ages, from elementary through high school, to college and adult choirs.